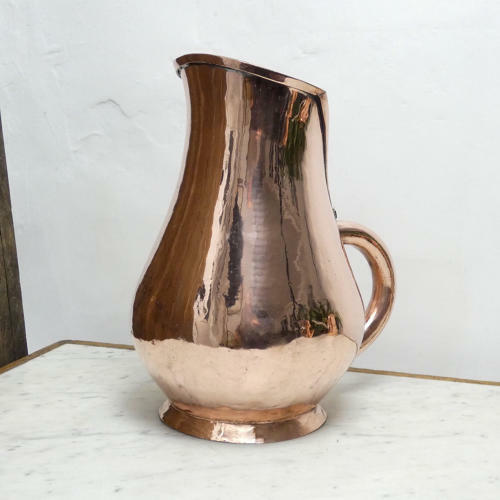 A superb, large French copper cider measure. This style of measure was used in Northern France and the measure is the amount that was contained up to the opening above the top of the handle. This one is engraved, to the front, with the measure 'DECALITRE', which is 10 litres, although the engraving is now quite worn. There are some other letters engraved beneath this but they are too worn to make out.The piece is a very impressive shape. It is well made, from a very heavy gauge of copper, and it has castellated seams. There is slight marking to the copper, from use, but other than that it is in very good condition. Price includes postage within the U.K. Shipping to the U.S.A. add £50. Western Europe add £20.